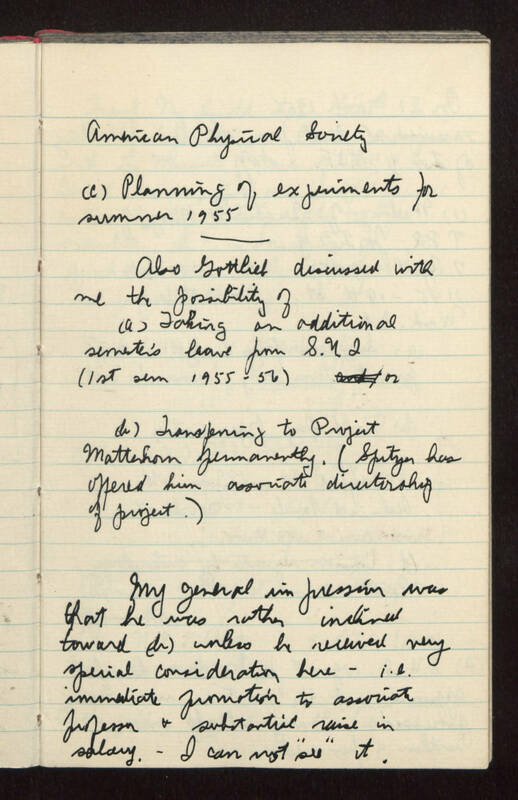 American Physical Society (c) Planning of experiments for summer 1955 ______ Also Gottlieb discussed with me the possibility of (a) Taking an additional semester's leave from State University of Iowa (1st semester 1955-1956) or (b) Transferring to Project Matterhorn permanently. (Spitzer has offered him associate directorship of project.) My general impression was that he was rather inclined toward (b) unless he received very special consideration here - i.e. immediate promotion to associate professor & substantial raise in salary. -- I can not "see" it.